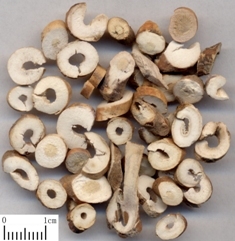 The PPRC identifies Moutan (Mu Dan Pi) as the dried root bark of Paeonia suffruticosa Andr. (Fam. Ranunculaceae). The nature of Moutan is slightly cold, it flavor is bitter and acrid, and it homes to the Heart, Liver and Kidney channels. Its functions include clearing heat and cooling the blood, activating the blood, and transforming blood stasis. It is indicated for toxin manulae, vomiting of blood, nose bleeding, feverishness during the night that abates in the morning, steaming bone disorder sans perspiration, amenorrhea, dysmenorrhea, abscesses and toxic sores, and painful traumatic injuries. Cooked Rehmannia (Shu Di Huang, 熟地黃) nourishes Kidney Yin and supplement the essence to engerder the blood. Cornus (Shan Zhu Yu, 山茱萸) nourishes the Kidneys, replenishes the Liver, and astringes the essence. Dioscorea (Shan Yao, 山藥) replenishes Spleen Yin to strengthen the essence. Cooked Rehmannia, Cornus, and Dioscorea are three tonics to nourish and tonify the Kidneys, Spleen and Liver. Alisma (Ze Xie, 澤瀉) drains dampness and neutralizes the greasy property of Cooked Rehmannia. Hoelen (Fu Ling, 茯苓) drains dampness and aids Dioscorea to strengthen the Spleen. Moutan (Mu Dan Pi, 牡丹皮) clears Liver heat and neutralize the astringing property of Cornus. Alisma, Hoelen, and Moutan are three draining herbs to eliminate turbid dampness, clear heat, and neutralize the properties of the three tonics. Nourishes the Liver and Kidneys. Traditional: Liver and Kidney Yin deficiency marked by soreness and weakness in the loins and legs, dizziness, tinnitus, night sweating, spontaneous and nocturnal emissions, tidal fever, a hot sensation in the palms and soles, thirst, dry mouth and throat, and red tongue with little coating, and a thready and rapid pulse. Modern: Menopause syndrome, hypertension, hyperthyroidism, infertility, cer, chronic prostatitis, diabetes, chronic nephritis, nocturia, neurasthenia, optic neuritis, central retinitis, and lupus. Cinnamon Twig (Gui Zhi, 桂枝) warms and unblocks the meridians and promote blood circulation. Hoelen (Fu Ling, 茯苓) strengthens the Spleen and drains dampness. Cinnamon Twig and Hoelen remove blood stasis, enhance Spleen Qi, and prevent miscarriage. Persica (Tao Ren, 桃仁) activates the blood to remove blood stasis. Moutan (Mu Dan Pi, 牡丹皮) activates the blood to remove blood stasis and cools the blood. Red Peony (Chi Shao Yao, 赤芍藥) nourishes the blood and Ying Qi to promote the blood from damage caused by blood-activating ingredients. Activates the blood to eliminate blood stasis and reduces masses. Traditional: Blood stagnancy in the uterus marked by mild and persistent uterine bleeding of purple or dark blood during pregnancy accompanied by abdominal pain that is aggravated by pressure; or masses in the lower abdomen with fixed pain and discomfort, or retention of the lochia; or dysmenorrhea with blood clots or amenorrhea with abdominal pain. A purple tongue or dark spots on the tongue and a wiry pulse are common signs. Modern: Gynecological disorders such as hysteromyoma, ovarian cysts, endometriosis, ovaritis, dysmonorrhea, irregular menstruation, lochioschesis, leukorrhea, pelvic tumor, pelvic inflammation, infertility; skin disorders such as eczema, urticaria, dermatitis, black spots, pimples, frostbite; nervous disorders such as neuropathy, nervousness, hysteria, neurosis; eye disorders such as sites, hemophthalmus, blepharitis, keratitis; lumbago, stiff and aching shoulders, headache, hypertension, arthritis, neuralgia, and rheumatism. Evodia (Wu Zhu Yu, 吳茱萸) warms the meridians, dispels cold, regulates the flow of Qi, and alleviates pain. Cinnamon Twig (Gui Zhi, 桂枝) dispels cold, warms and unblocks the meridians. Chinese Angelica (Dang Gui, 當歸), Ligusticum (Chuan Xiong, 川芎), and Moutan (Mu Dan Pi, 牡丹皮) activate the blood, remove blood stasis, and regulate menstruation. White Peony (Bai Shao Yao, 白芍藥), Gelatin (E Jiao, 阿膠), and Ophiopogon (Mai Men Dong, 麥門冬) nourish the blood and augment the Yin. Ginseng (Ren Shen, 人參) tonifies the Qi and strengthens the Spleen to promote generation of the blood. Fresh Ginger (Sheng Jiang, 生薑) warms the meridians, dispels cold, and minimizes the toxicity of Pinellia. Pinellia (Ban Xia, 半夏) dissipates distention and fullness and harmonizes the Stomach. Licorice (Gan Cao, 甘草) augments the Qi and alleviates pain while used in conjunction with White Peony. Warms the meridians, dispels cold, eliminates blood stasis, and nourishes the blood. Traditional: Deficient cold in the Chong (衝) and Ren (任) meridians with blood stasis, manifested by irregular menstruation (either early or delayed), persistent uterine bleeding, or bleeding between periods, or amenorrhea; fever during the evening; feverish sensation in the palms; dry mouth and lips; lower abdominal pain; abdominal fullness; a purple tongue or purple spots on the tongue; and a deep and tense pulse or a thready and wiry pulse. This formula is also used to treat female infertility. Moderns: Menopausal syndrome, infertility, irregular menstruation, functional uterine bleeding, primary dysmenorrhea, polycystic ovaries, leukorrhea, miscarriage, neurosis, chronic pelvic inflammation, chronic appendicitis, frostbite, eczema, calluses, and corns. Chinese Angelica (Dang Gui, 當歸) nourishes and activates the blood, and alleviates pain. Carthamus (Hong Hua, 紅花), Persica (Tao Ren, 桃仁), and Ligusticum (Chuan Xiong, 川芎) ctivates the blood, disperse blood stasis, and alleviate pain. Moutan (Mu Dan Pi, 牡丹皮) activates the blood and clears blood heat. White Peony (Bai Shao Yao, 白芍藥) nourishes the blood and alleviates pain. Cinnamon Twig (Gui Zhi, 桂枝) unblocks the meridians. Achyranthes (Huai Niu Xi, 懷牛膝) activates the blood, disperses blood stasis, and directs the action of other ingredients to the lower Warmer (下焦). Activates and nourishes the blood and disperses blood stasis. Traditional: Sub-acute or chronic pain in the lower abdomen and pelvis due to stagnant blood. Modern: Irregular menstruation, pelvic inflammation, dysmenorrhea, amenorrhea, endometriosis, ovary cyst, and uterine fibroid.